In our last set of Videos [Post #AzureFest Follow-up Videos] Barry and I talked about how to Register for a Windows Azure Account, Setting up a Hosted Service, Deploying your first Azure Application, and tearing down the Application. 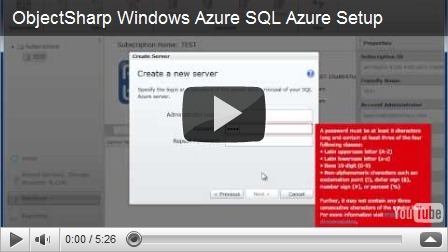 In this set of videos Barry and I walk-thru setting up a SQL Azure Database using the Windows Azure Platform Portal, as well as Generating Script files for the existing NerdDinner Application for Deployment into the Cloud. As explained at AzureFest, there are very few steps required to set up a Database on SQL Azure. The main thing to watch for in this video is the Firewall settings, this is important to keeping your data secure in the cloud. If you set up Firewall rules for Cafe’s or Restaurants, be sure to remove the IP Address Range from the Firewall before you exit the establishment. In this Video, Barry and I explain how to script the existing on premise databases from the NerdDinner Application and run those scripts against our newly created SQL Azure Database. 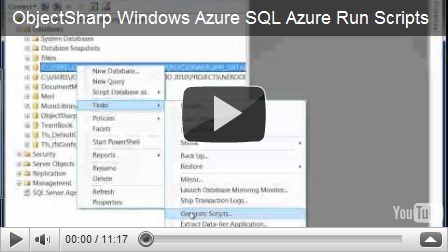 We also venture into the new SQL Azure Database Manager [Built on Windows Azure with Silverlight]. Look for some additional content coming in the New Year! Barry and I will be covering Setting up your environment, and deploying the full NerdDinner Application to the Cloud! This post also appears on SyntaxC4's Blog.